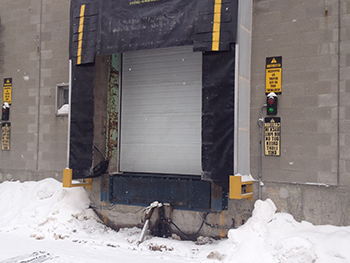 The MM-400 door seal isolates the trucks from 11’-6’’ to 13’-6’’ of the ground. It suits for a door opening of _____ large by _____ high and for the standard dock levelers of 48’’ to 50’’of the ground. The head and side pieces are composed dry wood lumber and covered with translucent plastic resisting to UV and to l’allumage d’une épaisseur de 0.055 gauge. 14’’ yellow lines are installed on both sides on the impact surface. The head curtain and sides panels included reinforcement for the return in normal position. Four flaps are fixed on each side at each end of the head curtain.